This was an odd match, as Del surrendered a 2-0 lead before taking it 3-2. Del started off sharp and fast and was in control of the rallies, Tomas was no mug though And had great perception of the game and knew roughly where Del’s shots wold go. But Del seemed to have the edge and as soon as he got to th T-Line seemed able to command the rallies; Del took the first to 15-10, 15-6; in the third game the match swung t oThomas Ewans favour, the rub of the ball and the luck seemed to be with th student and Del dodn’t do much wrong, just didn’t have the control of he rallies like before and Thomas took the third 15-12. Ewen was having to work hard and up his game to keep Sharratt at bay, the fourth game went the distance, indeed Sharratt served for the match at 15-14 up but the serve was out and Ewen rattled off the next two points to take it 17-15 and into a decider. Del refocussed and in the decider once again took control of the T-Line and Thomas didn’t have an answer as Del took the fifth 15-8. 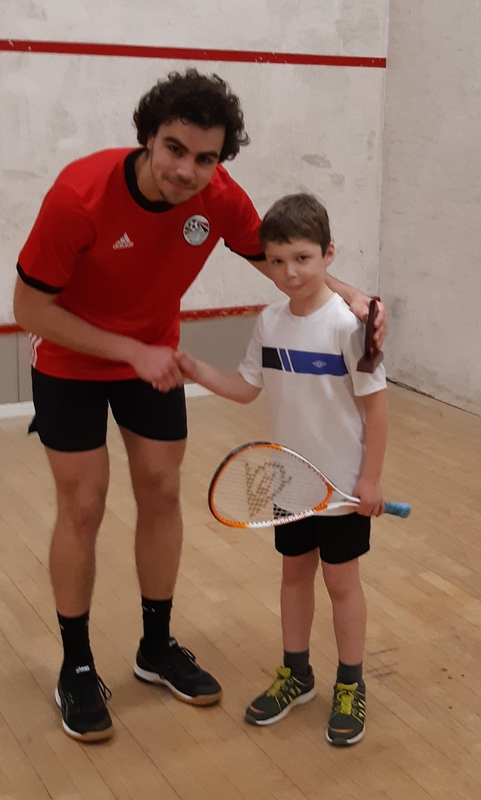 This one was 15-8, 15-5, 15-10 in the Borderers favour; a fairly straight forward victory for Laing who has one of the sweetest strokes at the club and was sending the student round the corners of the court. Iain Laing maintains his unbeaten status within the team with his record played 5- won 5. This oddly enough ended in exactly the same scoreline as the previous rubber with the Reivers taking it 15-8, 15-5, 15-10. But a completely different style of play. Reivers Veteran Spence used placement of shots to combat the speed and agility of the younger Graves-Morris. Spence played some tricky deceptive shots which caught the student out and earned a good 3-0 victory. WE were getting towards the business end of the teams as the battle of the second seeds made for some awesome viewing. Although Hosny seems determined to go 2-0 up in every match before winning 3-2 – this seems to be the story of the season for Hosny. Hosny used his prowess with full length and full width shots to keep Henning at the back of the court and control the match. But on the flip side Henning won out on all the front court rallies as Hosnys short game was found waining. Hosny took thfirst two 15-9, 15-9 before Henning really pushed the short game to come back with 15-10, 15-12 and 2-2. But whether it was stamina, concentration or home advantage – Hosny found the extra needed to take the fifth 15-6 for 3-2. Having had some tricky games lately, Elliot found this one more straight forward. Aitken was making his debut for Heriot Watt 4 and it was a baptism of fire as he came up against one of the strongest players in the league. Tony managed to command this from the start and although Aitken made some of the rallies last Elliot was too good and won 15-6, 16-4, 15-8. Several members from Gala Squash Club joined with Doctors and staff from the BGH to raise money for the Friends of the BGH. Over £200 was raised on the night for Lifecard devices for the Cardiology Dept. The format was straight knockout and 8 minute games. There was a Plate and a Bowl tournament for early round losers. 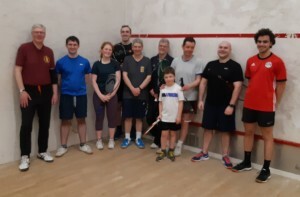 In the Final Amir Hosny beat Iain Gorman 16-13; the Plate final seen Ruaridh Kohler triumph over Lucy Black and the bowl tournament champion was John Barrow who narrowly defeated Andrew Graham. Organiser Del Sharratt said “What a great event, we support the Friends of the BGH every couple of years with Charity matches and these are generally well attended. Pic 1 – Tournament Champion Amir Hosny and Player of the Night Sasha Graham. Pic 2 – some of the players from the night. Del was quietly confident going into this tie. Bernard, although a seasoned veteran was 30 years Del’s senior and Del was hopeful his stamina could win out. This proved to be a false hope for Del. Bernard had accurate shots and used the full length lob several times which always seemed to find the nick at the back of the court and Del couldn’t get the shots back. Del tried to boss the rallies by dominating the T-Line but Bernard would throw in a lob every so often and this would be good enough to beat Del, the match wa 15-12, 15-9,15-10. The games here were 15-13, 14-16, 14-16, 11-15 and the match could have gone either way. Bensted has a hard fast shot and Clemens had to be quick to react to get the shots. This match was as much a mentally tiring as physically as the players had to react quickly to the fast shots. Tom used home advantage in the bounce of the ball and the heat in the courts count and just sneaked the victory in a close tie. Abercorn Captan Sarkar has been out for several months with an injury, but s=there was no signs of this hindering Neelu’s performance tonight. Reivers Veteran Spence was trying to send Sarkar to the front of the court so he would have to lunge in the hope that he may still be feeling the after effects of his injury. But if anything Sarkar seemed to be back more refreshed than ever and has obviously been working hard on fitness and movement over his spell out. This was an exciting match up and the scores went 11-15, 15-11, 11-15 as little separated the players. Spence’s usual deft drop shots weren’t quite coming off for him and he surrendered several points in each game by hitting the tin from the drops. Sarkar proved equal and more to whatever Spence threw at him and won 3-1 for the City Side. Browse record against the Border side now reads p6 w6 as he remained undefeated. On another night the result may well have been the other way rund but Hosny’s mind just didn’t seem to be on the game. Browse opened the match 15-9 and 15-1, then Hosny took a couple of minutes at the end of theseconf game and Captain Del Sharratt took the opportunity to motivate Hosny to keep focussed and get mentally attuned to the game; Sharratt also advised Hosny that Browse was trying to slow the game right down to suit his own style and told Hosny to go out all guns blazing. Hosny must took something on board as a completely different player emerged in the third game. Hosny exploded out the blocks and played a fast flowing game to disrupt Browse slower play, Hosny won it 15-10 and carried this onto the fourth. Browse was trying to play the referee and claim some soft lets but the referee was having none of it and dismissed Browse claims. Hosny seemed to have the nack of coming from 2-0 down to win games and this tie went to 14-14 before Browse pulled out some excellent cross court shots to win 16-14 for 3-2. Tony seemed a bit out of sorts in this tie and was swiping at several of Senga’s serves. Tony found it difficult to get on top of the rallies, and former Scotland International Senga used her accurate lob serves to dominate the rallies, whenever they got into rallies Tony proved to good but senga would ratle off several points jst from her serves, this was good enough for the first two games which Senga took 15-13, 15-12. But like Amir, Tony emerged a different player in the third and was more like the Tony Elliot we know (and, begrudgingly admire!) and had the measure of Senga’s serves. Tony rattled off the games 15-6, 15-3. But Senga dug deep in the fifth and used all her guile to win 15-11 For a huge Scalp. Sir Andrew found he was chasing this game from the off, Malcolm was straight out the blocks and took a 4-0 lead fairly quickly. Sir Andrew was just a wee bit too slow and Mitchell rattled off the points and won the first 15-5. Although Sir Andrew had the shots and the knowhow, this seemed to be a low key performance for the Reivers veteran. Sir Andrew just didn’t seem to have the right movement and kept getting himself in a twist, Mitchell had a focussed performance and took the next games 15-8, 15-7. The 15-9, 15-11, 15-9 scoreline flattered Tinning a bit in this game, this was a more exciting match, Tinning seemed to have the knack of keeping Sharratt behind him and therefore dominated most of the rallies. It was the odd lapse of concentration from Sharratt that meant his normal safe shots didn’t find the target and Tinning would pounce and kill the ball. This made it 2-0 to Hatton. This was another 3-0 victory for Hatton; Spence was a bit fatigued having travelled around the country on business for most of the day and this hindered his movement slightly and Miller, although not particularly quick himself mastered his footwork and moved smoothly around the court. Spence gave a goo showing and found the corners with a lot of his shots but Miller won 15-8, 15-6, 15-7. This was a fantastic match up, this was a fast speedy performance from the players, neither player really pulled away and Govan just had that wee bit of Luck that meant most 50/50 rallies ended in his favour. Hosny’s forte was sending Govan to the back of the court and had great length on his shots, but Hosny’s lack of killer edge at the front meant Govan could capitalise and it was close at 15-11, 15-13, 15-10. Tony Elliot mad this look ease, but it was a tight tussle. Love, who hadn’t lost at home all season oozed confidence but Tony showed his prowess around the court and some great reaces and counter attacks from Tony were the main difference. Tony found when he reached the front court forehand drops that Alan couldn’t handle his fast cross court returns and this got several points for Tony. Tony won the Borderers only points of the match with 15-7, 15-13, 15-10. Captain Sharratt Said afterwards “this is our biggest defeat of the season, Hatton had a strong strong team and it’s obvious why they are top of the league. This was always going to be a tough game but hopefully this spurs us on for the remainder of the season and we can bounce back with a win at Abercorn next week. Club Championship 2nd round. Piers Wilkinson 3-1 Ruaridh Kohler..